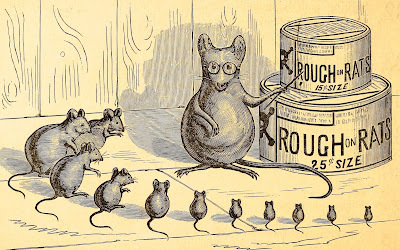 BOTTLES, BOOZE, AND BACK STORIES: Ephriam S. Wells Was “Rough on Rats” And People? 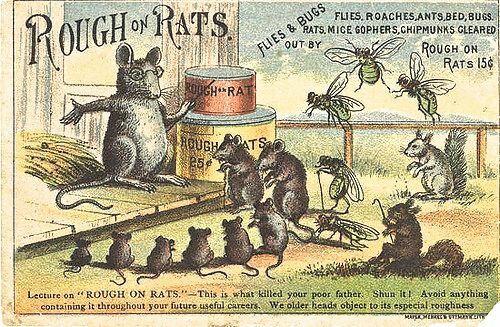 Ephriam S. Wells Was “Rough on Rats” And People? Shown here, the box lid is a colorful celluloid picture of a Chinese gentleman with a long pigtail, a cooly hat, and an embroidered tunic who apparently is about to eat a rat while in his other hand he holds a second rat, apparently also about to be consumed. 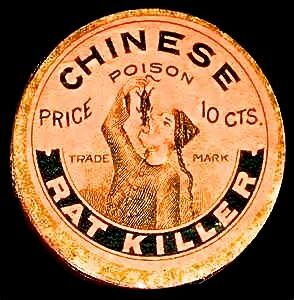 The racist image perpetuated a long-held belief among some Americans that the Chinese on a regular basis ate live rats as a snack. The Chinese also appeared in “Rough on Rats” advertising. 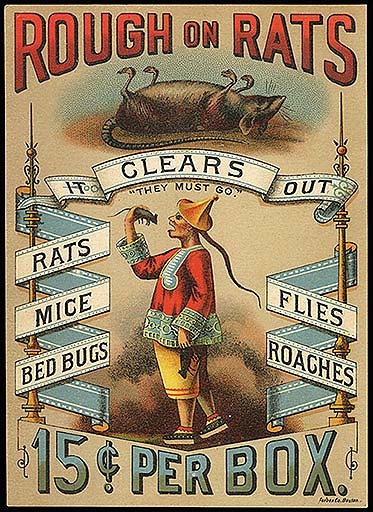 Unlike Europe and other European countries, the United States had no national poison control laws and state regulation often was weak and inconsistent during the late 1800s. Despite “Rough on Rats” being largely white arsenic with some fillers, Wells was able to able to elude laws some state laws that outlawed the sale of poisons to minors or required registration when sold to adults by marketing his arsenic under its trade name. Nowhere in its ads or packaging were there warning to humans. A similar card, shown below, includes the other pests “Rough on Rats” was to eliminate, including gophers, chipmunks, mice, flies, roaches, ants and even down to bed bugs. Still another colorful Wells trade card depicted a rat being chased in turn by a cat, a dog, a boy with a hatchet, a man with a whiskey bottle, and a woman with a broom. 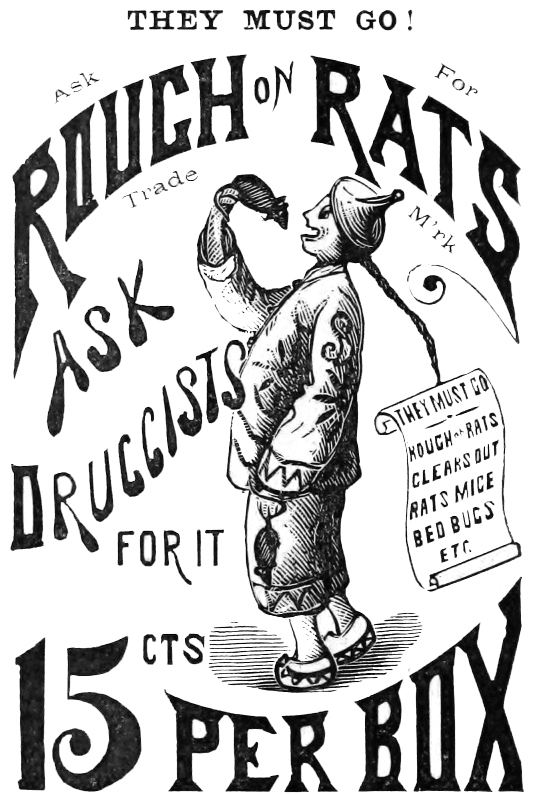 The druggist took advantage of this card to market other proprietary medicines he had invented, including “Well’s Health Reserve,” and “Mother Swan’s Worm Syrup. Wells also featured a series of “Rough on” medications to remedy toothaches, itches, corns and even piles (hemorrhoids). 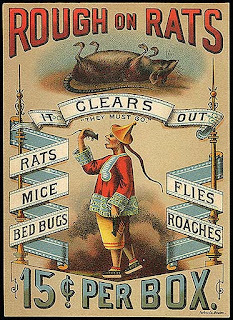 In 1982 Wells took the additional step of publicizing his rat poison by commissioning sheet music to sing its praises, anticipating the advertising jingle. The song was created by two well-known music men of the time. W. A. Boston wrote the lyrics including the chorus, repeated several times, that opens this post. The music, by Juniper Jones, was suggested as suitable for dancing. 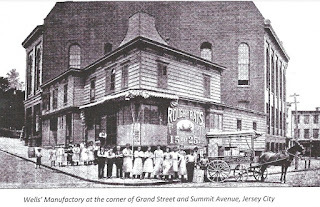 Working from his factory located at the corner of Grand Street and Summit Avenue, Wells concentrated on selling “Rough on Rats” and his other products full time through mail order sales, with extravagant spending on advertising in the United States and other English speaking countries. It paid off. Over the next twelve years his profits exceeded $2 million, equivalent to $50 million today, from individual sales of items costing ten to twenty-five cents. Shown here is a company check that features the rat poison and various other Wells products. Beginning as a lowly drug store clerk and often on the brink of bankruptcy, Well’s concoction of a powder that was odorless and tasteless to its rodent victims but deadly, eventually brought him fame and fortune — even though “Rough on Rats,” a name suggested by his wife, too frequently also was administered to humans. In the last decade of his life Wells retired to his summer house in Glenmoore, New Jersey, living like a country squire and raising horses. 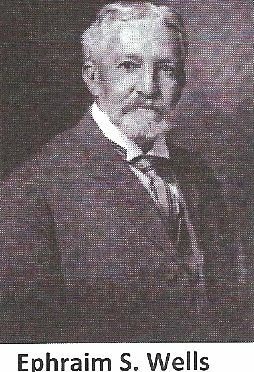 Wells died — of natural causes — in March 1913, leaving a substantial estate. 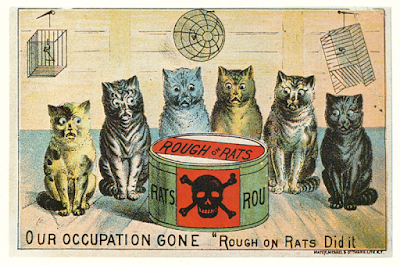 The “Rough on Rats” brand continued to be sold into the 1950s. Like other successful nostrums, it attracted copycats, one of them perpetuating the racist Chinese image. Note: Thanks to Professor Loren Gatch for much of the information provided in this post as well as for a number of the images shown here. Professor Gatch was associated with the University of Oklahoma when he published an article on Wells and his anti-Chinese bias.